Senn High School Principal Susan Lofton was removed from her leadership role Friday amid an investigation by the school district's Inspector General. EDGEWATER — Popular Senn High School Principal Susan Lofton — credited with helping transform the North Side school — was removed from her post Friday amid an investigation by Chicago Public School's Inspector General, officials said. The school's Assistant Principal, Carter Carey, will act as the administrator in charge of Senn until an interim principal can be chosen, according to a CPS official. "CPS has high standards for its school leaders, and the District takes any allegation of impropriety very seriously," CPS spokesman Bill McCaffrey said Monday night. "While we do not comment on personnel matters, our focus is on ensuring this school has a strong leadership team in place to effectively support the school's students and staff." CPS said Lofton was removed "pending a pre-suspension hearing." Dismissal charges against Lofton — the school's principal for more than five years — were currently being reviewed by the district's CEO and general counsel, CPS said, but officials would not comment further "due to the ongoing disciplinary process." In the coming weeks, Lofton will be paid while she goes through the pre-suspension hearing, CPS officials said. If officials find the charges against Lofton legitimate, they will refer the case to the Illinois State Board of Education to decide if she should be fired, a process that typically happens about six months after the pre-suspension hearing, CPS officials said. Lofton could not be reached for comment. On Friday, Carey sent an email to staff alerting them to a meeting 8 a.m. Monday morning with him and Network Chief Philip Salemi. DNAinfo obtained a copy of that email. Lofton was not included on the email. "As a strong supporter of Senn, I am deeply disappointed by this news," Ald. Harry Osterman (48th) wrote in an email to residents Monday evening. "Senn is our community’s local high school, and it must be a safe, inclusive and outstanding learning institution for all the students and families in our community." Alexander Orsi, an Edgewater resident who is considering sending his child to Senn, said he learned about Lofton's removal during that Monday after he went to the school to learn more about the school's international baccalaureate program. The program's coordinator was in the emergency LSC meeting, so he also sat in. "We thought Senn would be the answer under Principal Lofton's strong leadership and transformation of the school," Orsi said. "With all of the turmoil and negativity CPS gets itself into, I had hoped they would be more forthcoming, but the chief and another CPS rep from I believe legal kept shutting my requests down." He said during the meeting, Salemi said Lofton was being "reassigned," but would not specify what that meant. Salemi did not respond to requests for comment. On July 17, Susan Lofton was removed from her position as Principal of Senn High School. CPS has appointed Mr. Carter Carey as the acting administrator for Senn. Mr. Carey has been a long time member of the Senn community, first as a teacher then an administrator. He has the strong support of the Local School Council and the faculty during this time. CPS is currently searching for an interim principal who will fit the needs of our remarkable school. "We Bulldogs can use this as an opportunity to celebrate and build upon many of the improvements made over the past five years. It is critical to note that the entire Senn community, including a very talented faculty, valuable community partners, our close university partner, Loyola University Chicago, dedicated parents and our Friends of Senn group, collectively contributed to the revitalization of Senn High School, and remains committed to continued progress. "Senn is poised to make the next upward turn toward its future as a model neighborhood high school in Chicago. As our IB and Magnet Arts, as well as our community programs, continue to improve, Senn will remain a place that teachers, parents, community, and most importantly, students, will be proud to claim as their own." The Sun-Times reported that sources said Lofton was removed for allegedly lowering admission test scores for students who required special education in an effort to block them from Senn's Magnet Fine and Performing Arts Program. CPS officials would not confirm the report. If Lofton's case makes its way to the state board, her trial will be overheard by an officer "jointly selected by the [state] board" and Lofton's lawyers, a CPS official said. If she's found guilty of the charges, the board's members will vote to either accept or reject the charges. If accepted, Lofton will be let go, district officials said. Only then can Senn award a new principal a contract. Lofton graduated from Kelvyn Park High School and volunteered with the Chicago Public Library as a literacy tutor in the '80s. She went on to teach English at Lincoln Park High School and Benito Juarez Community Academy in Pilsen before moving to CPS headquarters to work on curriculum development. 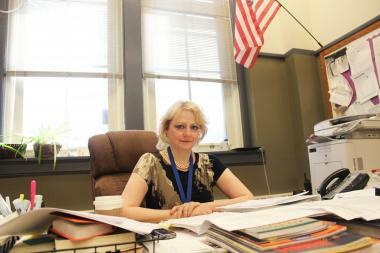 She started as an interim principal at the end of Senn's 2009-10 school year. She was the school's third principal that year. Science teacher Bill Koulias, a 14-year veteran of the school, said previously that Senn needed a strong leader. Lofton showed staff "we don't have to settle for the status quo," he said. Senn saw dramatic improvement in many areas that led it to receive an "excellent" ranking in 2013.